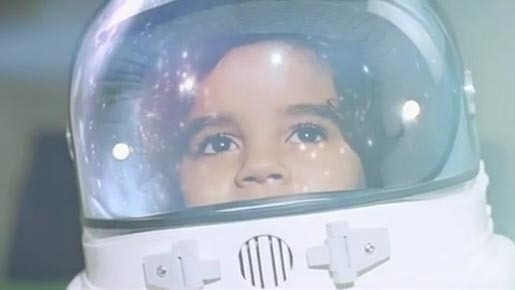 BBC Two is promoting its School Season focus on education with “BBC Adventure”, a television commercial featuring the launch of a young astronaut. BBC Two School Season brings together a major season on education, focusing on UK schools and the tough choices parents have to make. The BBC Adventure ad was developed at RKCR/Y&R, London, by creative director Damon Collins, creatives Andy Forrest and Nicola Hawes. Filming was shot by director Yann Demange via Red Bee Media, producers Phil Barnes and Bridie Harrison, director of photography Tom Townend. Post production was done at Glassworks by 3D team Stephen New and Jon Bragado, Flame Lead Ruben Llusia, Flame team Iain Murray, Duncan Malcolm, Warren Gebhardt, smoke artist Aleks Ugarow, colourist Ben Rogers and producer Katie O’Mahoney. Sound and music were produced at Factory Studios. Music is “Space Oddity”, the 1969 single hit by David Bowie.